How to interface and use Matrixx Standard/Enhanced switch modules : Manitou Systems Inc. This page includes ideas and concepts on how to install the Matrixx RF / DC switch module into a typical plasma processing system. Each application, installation and, hardware set is different so please use this information as a guideline and contact the Manitou Systems “RF Witchdoctor” with your comments and questions. The schematic below is typical of the need to switch 2 magnetron sputter cathodes between 2 plasma power generators. There are two functional options that will determine which switching configuration is required and how the switch module will behave; 1) Only 1 plasma output will be active at any time and, 2) Both plasma outputs will be active. Please take note of the required coaxial cables and their suggested maximum lengths. The rule of thumb is to keep all RF power carrying cables as short as possible. The DC power carrying cables are not as sensitive to length so they can be a lot longer. The path from the matching network output > the plasma is critical so please keep this in mind when designing your system. The Manitou Systems Witchdoctor suggests mounting the Matrixx switch module directly to the matching network’s output connector using a coaxial adapter. See an image of the Standard Matrixx switch to the right. Another approach is to mount the Matrixx switch next to the matching network. The image above left shows an Enhanced Matrixx model mounted on top of a matching network. The match network’s plasma output is connected to the Matrixx switch using a very short coaxial cable prepared with 90 degree connectors at each end. For tighter and/or more complex installation, you can use a combination of straight and 90 degree connectors and adapters. This configuration is more expensive based on the use of coaxial adapters however it may provide necessary installation flexibility. The graphic below illustrates a few of the optimal installation positions that we suggest using. Manitou Systems can furnish all cables and coaxial adapters along with the Matrixx switch module to complete your installation. The image to the right shows one method to connect three sputtering cathodes to the Matrixx Switch. Alternately, mounting the Matrixx next to the cathode power feed points enable direct connection (better approach) so, the short extension cables are not necessary. The Matrixx 24VDC control connection is a D-Sub 15 connector located on the side of the enclosure. 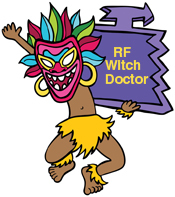 The Witchdoctor suggests that a shielded cable be used to connect to the plasma system controller or other source of switched DC control power. When the Matrixx is purchased with it’s complementary control panel, we supply a properly shielded cable. When using Matrixx Switch Modules with high power RF switching applications (typically above 1kW) you must take into consideration the RF circulating currents flowing in the connection between the matching network’s plasma output and the Matrixx switch module input OR the magnetron sputtering cathode. It should be noted that magnetron cathodes with dielectric target materials create the highest RF currents. Typically used coaxial cables (such as type RG393) are useful at power levels below 1kW however some users connect two cables in parallel to share the current load. This approach is not necessarily the best method as it increases the cable’s total capacitance value making matching more difficult as well as requiring 2X the cables and connectors. Long lengths (over 3′ or 1m) can create the same high capacitance problems. The failure includes melting or migration/flowing of the cable’s center insulator which will result in arcing. Our Powerline rigid cables are designed for this type of high current service providing reliable and efficient power transfer to the plasma load. Click here for a link to the cable page.